Dieter Dengler: When something is empty, fill it. When something is full, empty it. When you have an itch, scratch it. For what feels like the first time in the last five years, someone has crafted a war movie that is not concerned with drawing loose comparisons between itself and America’s War on Terror, in an effort to criticize the already heavily debated validity of the war. German director, Werner Herzog, is more interested in telling a story ripe enough with its own depth and desperation to capture the viewer’s attention without having to rely on political disparagement and moralistic preaching to give the film its ultimate significance. 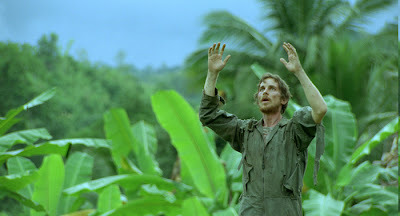 RESCUE DAWN tells the true story of Dieter Dengler, a German-born aircraft pilot for the American Navy (played here by the almost always stellar, Christian Bale), who has been sent to Vietnam in 1965, at a time when America’s intentions for Vietnam were not yet clear to the general population. He expected to get some flying time in but had no concept of what was actually in store for himself (much like the American government). Shot down on his first time out over Laos, Dieter is captured by locals and imprisoned in a camp along with a handful of other men. What he and his fellow prisoners endure in their enforced seclusion nearly destroys their minds and spirits but also makes for a gripping film about the strength of the human will. Of course, one can infer criticism of the American government and its military practices in Herzog’s text. Considering the common comparison between America’s invasion of Iraq and their previous invasion of Vietnam as similarly fruitless and devastating war efforts that were potentially unnecessary to begin with, it would be hard not to make links between the two. Herzog elevates RESCUE DAWN though by not making all of this so obvious and allowing viewers to form their own thoughts on the subject. Still, it is hard not to condemn the American government for not disclosing the truth behind their involvement in Vietnam, when soldiers are being tortured in combat situations that don’t technically exist on paper. Dengler fights for America but has no idea what America is fighting for. Despite the injustice, if you see no comparison, then you are still left with the compelling character of Dieter Dengler. The naïve, boy-like charm of the pilot who always wanted to fly can always be seen as a distant sparkle in Bale’s eyes. And albeit terribly faint at times, his hope is still enough to inspire the same in the other prisoners when they felt they might never feel anything like that again. Although the RESCUE DAWN shoot was probably more like a day of spa treatments when compared with the real life experiences of Dengler and the other detainees, it is clear just from watching that it couldn’t have been easy. 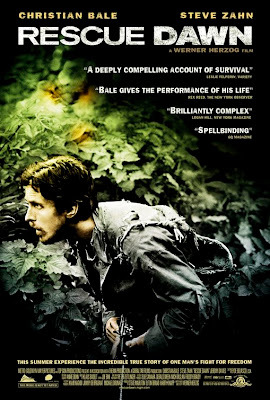 Alongside Bale, American actors, Jeremy Davies and Steve Zahn (in his most mature performance, resulting in a complete transformation), fight their way out of suffering. While it has been reported that Zahn lost over 40 pounds for the role (and that there were no trailers on location in Thailand), Davies is seen without his shirt often in the film. His protruding rib cage and twig-like arms are sickening to the point where I had to look away. Meanwhile, Bale and Zahn must battle the elements throughout their ordeal. They are seen going over rapids, being dragged along the dirt, ingesting maggots and being carried away by mudslides. For their perseverance and fortitude alone, Bale and Zahn deserve recognition for their performances. However, it is their embodiment of men long gone and lost to the dark depths of their minds that push themselves to continue when they are running on nothing that will be most memorable in years to come. Dieter Dengler is humbled by his experience just as I was humbled by RESCUE DAWN. Dengler is a man of principle with a sense of entitlement that undergoes great growth. He is arrogant when he bombs Vietnam and then expects his captors to extend him the courtesy of using a bathroom. He is smartening up when he will not sign documentation that will supposedly expedite his release and get him home sooner. And he exhibits a newfound sense of responsibility when he takes all the prisoners under his guidance and inspires new faith in their souls while ensuring that they are equipped with the tools necessary to make their awakened dreams a reality. RESCUE DAWN brings its characters and its viewers deep into the jungle and shows how there can be a way out for those brave enough to push on towards it.